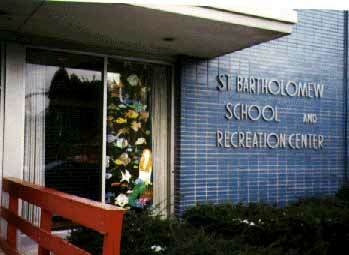 "Plastique-the Ocean Show" visited the Saint Bartholomew School, Chicago, Illinois in '97, as part of the Global Art Project. 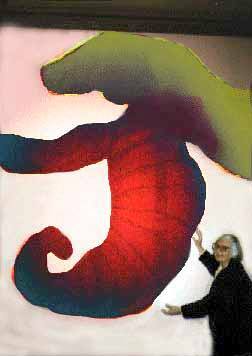 (see hot links) The students sent a school of fish which for a year appeared here on the web site, and suffered numerous photoshop experiments. Their fish hit the walls at Lincoln Center along with the show "Physicians and Their Art". 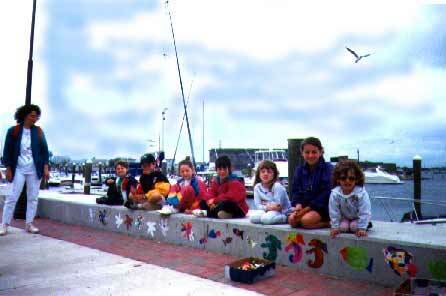 They made an impromtu appearance at the Atlantic City Seafood Festival, multiplying and dividing and being colored by children up and down a long concrete wall. This year, June 13 they return to Atlantic City. After this, they paid a visit to a State function in Trenton, N.J. at a Masonic Lodge. On this day, Senators came through and posed with the fish cast on the walls with an overhead projector. The photos did not come out. Months have passed and an Advanced Photoshop class has come and gone and now one of the fish has begun to materialize. Jackie Rubel, Princeton, NJ, can be seen giving it a little support! Now their fish will reappear, transforming from translucent images to become a part of the show, "Magnetic Connections". See the main index and click on the red button. The fish images will become a part of the Traveling Magnetic Show, a show with spare parts! The fish are all reappearing as magnetic pieces.